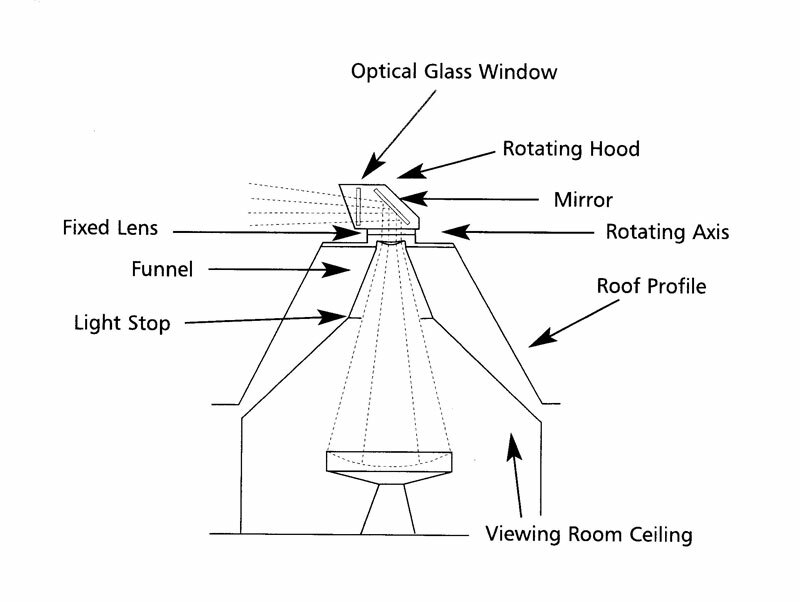 The Camera Obscura consists of a darkened, octagonal shaped room with an inverted funnel shaped ceiling. Mounted in the funnel spout is a fixed lens above which is a rotating mirror set at an angle of approximately 45 degrees. In front of the mirror is an optical glass screen which protects both the mirror and the lens without affecting the true colour of the objects being viewed or distorting their image. The lens is solidly mounted below the rotating axis of the hood thus eliminating vibration. Beneath the lens is a floor-mounted, saucer shaped viewing table. Focal adjustment is obtained by raising or lowering the table.